Each month for the past two years, the Cottage Cooking Club, founded and led by Andrea, The Kitchen Lioness, has been cooking through Hugh Fearnley-Whittingstall’s River Cottage Veg, a vegetarian cookbook with many delicious and often easy recipes for incorporating seasonal vegetables into your daily menus. I joined the group a few months after it started in August 2014. This month, we reach the end of the journey through this book. Unlike my French Friday adventure, I did not cook every recipe in the book, but as a group, we collectively hit every single one. This month, I chose two recipes. Here’s my take on them in the order I prepared them. The spinach and thyme pasties were fabulous! I was a little surprised how well the pastry crust recipe worked. According to Michael Ruhlman, the ratio of many classic recipes, such as pastry crust, are used universally. This recipe called for nearly twice as much flour as I’m used to, in fact the same weight of flour and butter. I was concerned the crust would be dry, crumbly, and difficult to roll out. No cause for worry as it worked perfectly. 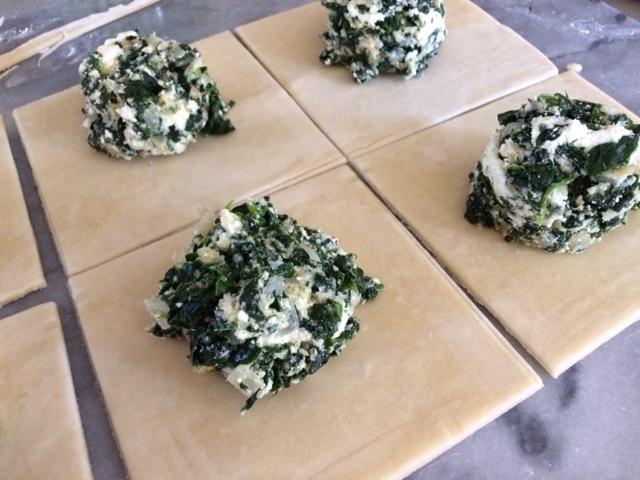 The filling was a mixture of steamed spinach (squeezed dry) along with sautéed onion and garlic, lemon zest, farmers cheese, grated Parmesan, and chopped fresh thyme. 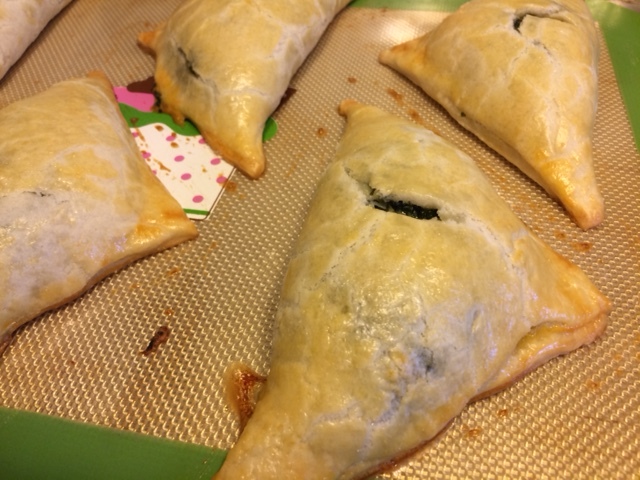 After cutting the pastry crust into squares and topping with filling, they are folded over diagonally to make gorgeous pasties (aka turnovers or hand pies). A coat of egg wash burnished to the perfect shade of gold when the pasties baked. The highest compliment came when Howard brought one for lunch a few days and was asked by several of his colleagues where he bought the hand pie. “My wife made it!”, he said. They were impressed. I enjoyed the celery rarebit as well. 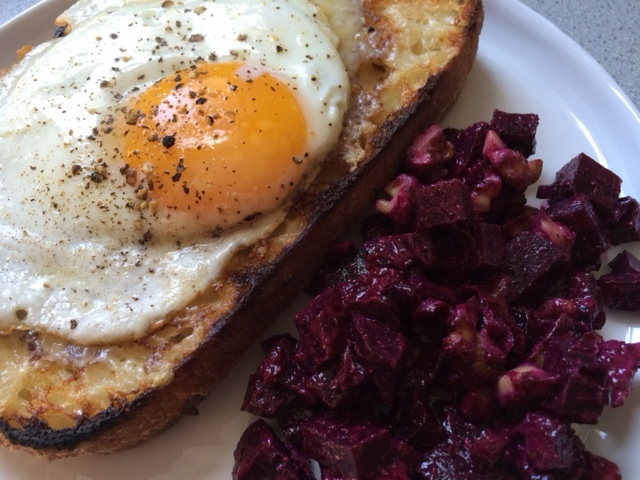 Rarebit was standard fare in my single days. I used the recipe in the original Moosewood cookbook which uses ale instead of milk. In those days, I would spoon the rarebit (which was much runnier than Hugh’s version) over toasted English muffins and sliced apples. I was interested that this version was more of a “toastie”. The rarebit was super thick, definitely spreadable after it cooled down, making it easy to prepare sandwiches on subsequent days. 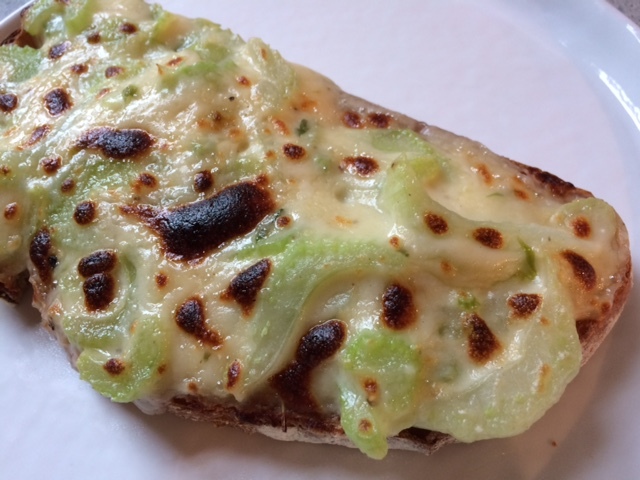 I opted to make the celery variation where thinly sliced sautéed celery is stirred into the cheesy rarebit. The sauce is spread over toast and broiled until bubbly and browned. I like the idea of the toastie offered in this recipe, though I missed the yeasty beer taste that complements the cheddar cheese so well. I would make this again, but would try substituting ale for some or all of the milk as suggested in the headnote. Also nostalgic for the apple and cheese flavor combination, one day I topped the toast with thinly sliced apples before spreading the rarebit over it. Another winning variation! 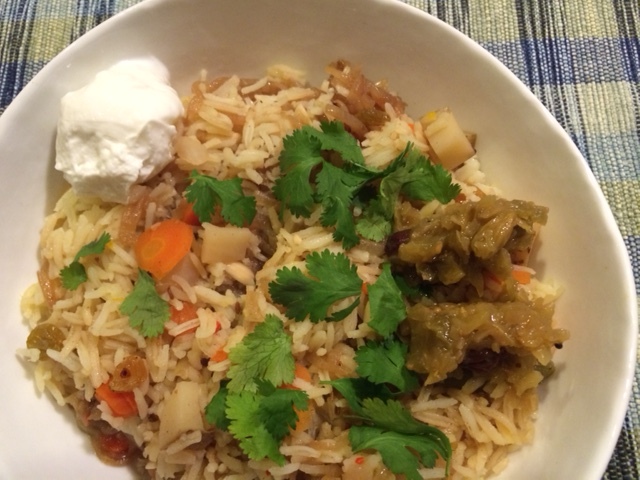 As a final note, I managed to make the vegetable biryani after my last Cottage Cooking post. I’m sad to report that it didn’t work for me at all. There was way too much liquid that never evaporated or got absorbed. This seemed to dilute the flavors because it turned out more like a watery rice stew than the interesting rice and curry combination I’ve had at Indian friends’ homes or at restaurants. I couldn’t even finish the leftovers because it lacked flavor of any kind. Bummer, but it happens. As I wrap up my adventure with Hugh’s River Cottage Veg, I’ll share some reflections. Over the course of these many months, in addition to enjoying many satisfying recipes from this book, I was able to cook virtually with some of my old friends from French Fridays and to make new friends that I met through the Cottage Cooking Club. It was equally fun to compare notes on common recipes made and to get reviews on ones that I wasn’t sure about or didn’t have time to make. While I made only a fraction of the recipes, a majority of the ones I did make deserve an A+. There are a few, including the oven frittata and roasted Brussels sprouts and shallots, that I’ve incorporated into my repertoire and make repeatedly. I’ll admit that there were a fair number of recipes that included ingredients or flavoring that wouldn’t fly at my house (fruit – dried or fresh, curry spices, eggplant) but with the collective goal, I could just skip them, guilt-free. I will definitely go back and try several that received high ratings from other members but I haven’t had a chance to make yet. Next month, the group will continue with additional cookbooks by Hugh Fearnley-Whittingstall: River Cottage Every Day and the soon-to-be-published (October 2016) River Cottage Love Your Leftovers. I’m going to bow out for now, but will still avidly read others’ recipe reviews each month. To check out my fellow Cottage Cooking Club member’s blogs to read their reviews of April’s recipe selections here. Until we meet again, Ciao! I’m so excited to further my exploration of French cooking with my friends from Cook the Book Fridays. This week, I tried the fried ham and cheese sandwich known as Croque Monsieur and the variation topped with a sunny-side up egg known as Croque Madame. The version I tried was from David Lebovitz’s My Paris Kitchen. I am a huge fan of grilled or pressed sandwiches of any kind. There are a couple of things that make a Croque Monsieur different than other combinations I’ve tried before. To start, the bread is spread, not with the usual condiments of mayonnaise or mustard, but with a béchamel sauce. The sauce is simple to make. Milk is simmered with a roux until it thickens up enough to be spreadable. Thin slices of prosciutto and Gruyere are layered onto the bread to make a sandwich. 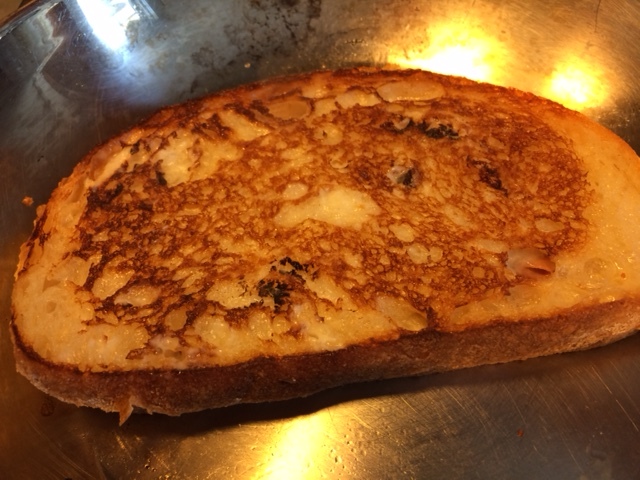 The bread is coated generously with melted butter and both sides of the sandwich are grilled in a skillet while another heavy skillet presses it down. The weight both squishes the sandwich and ensures a lovely browned crust on the underside of the bread. Finally we get to the other step that distinguishes the Croque Monsieur. The top of the sandwich is sprinkled with grated Gruyere (who doesn’t love cheese?) and broiled until the cheese is browned and bubbly. Yum! This isn’t really an “eat with your hands” sort of sandwich, more of a knife-and-fork sandwich, which I think is more traditionally French anyway. I remember ordering a sandwich in Paris and whilst eating it, looked around to see that I was the only one with the entire sandwich in my hands, rather than a dainty bite-sized piece of it on a fork. I served the sandwich as recommended by David Lebovitz with a green salad with a mustardy vinaigrette. The salad helped cut the richness of the sandwich. I liked the sandwich so much that I made it a second time, this time transforming it into a Croque Madame by placing a sunny-side egg on top. Out of lettuce, I served it instead with a beet and walnut salad which I make with a mustardy vinaigrette. This is a new favorite but because of its decadence, something that I can’t justify enjoying every day. Howard didn’t get to try it yet, but I’ll make this for him for a weekend lunch one day soon. 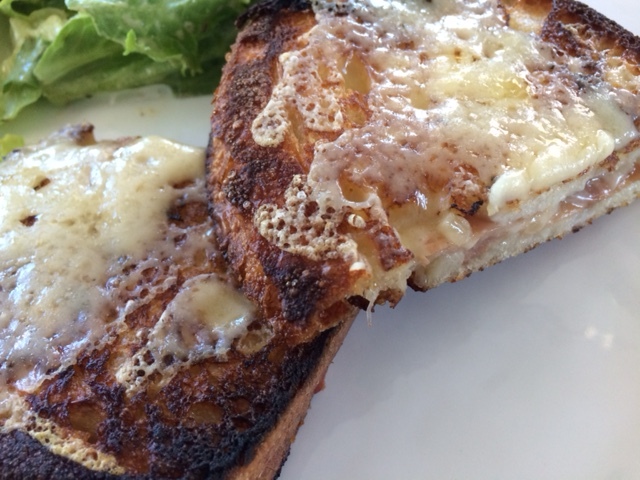 Croque Monsieur was in the air this week. I was catching up on podcasts. Spilled Milk recently did a podcast about Ham & Cheese Sandwiches where Matthew and Molly (when they stayed on topic) chatted about Croque Monsieur. I also came across a recipe in an old magazine where they made their sandwiches a little differently. 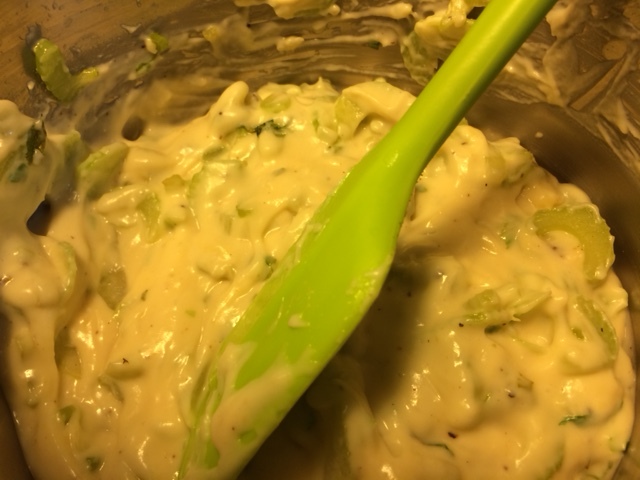 They spread the bread with mustard, then after grilling, spread the béchamel on the outside of the sandwich as glue for the grated cheese topping. That sounds like an intriguing variation. I still have ham, cheese, bread, and béchamel , so I might try making it that way for lunch today.